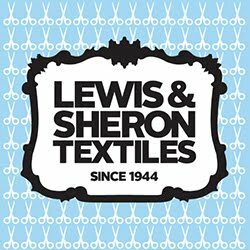 This morning I am gushing about my favorite, my go-to, my home-away-from-home fabric store: Lewis and Sheron in Atlanta, Georgia. As a child, my mom and grandmother took me everywhere with them. We lived about 2 1/2 hours south of Atlanta, and I've probably made that trip about a thousand times. We'd take off for Atlanta for anything home related, for homecoming or prom dresses, for back to school or Christmas shopping....any old excuse would do. The upholstered headboard, while recovered, is now in my 3 year old son Henry's room, and the chair is in my study. It really was a true lesson in investment of quality pieces. 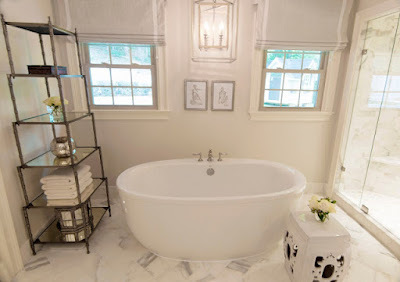 Now, as an interior designer, I am so thankful to have the relationship that I do with Lewis and Sheron. 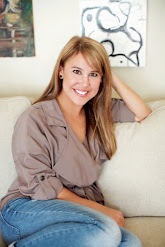 They have literally watched me grow up, and are so stinkin' good to me and my clients. Sam is always there to say hello, and Crystal and BJ with my crazy orders, and Tracy was in the Staceage room, and Gail, Betty, and Cindy up front, and Rico, Ward, Kenny, Jerry and Tony to help me get things in the car. Love seeing all of those familiar faces! From a child, to a college kid, to a married woman, and as a waddling pregnant mom, it's been a pure friendship all these years. I use them in every proposal I make for my clients. Whether its a classic buffalo check, a fabulous trim, a chic cream linen, or a fun floral...or all of the above.....Lewis and Sheron's gorgeous inventory is around me all the time. So, in honor of their fantastic staff, and beautiful fabrics, and trims, I am sharing some of my favorite Lewis and Sheron bedecked rooms of mine. 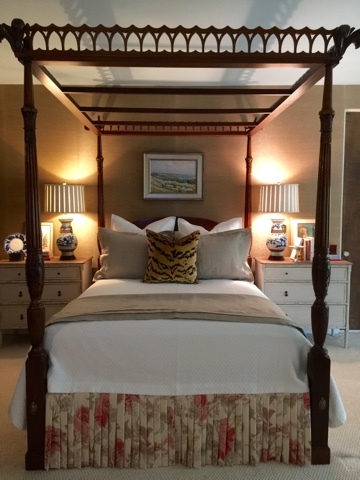 Here I used a classic linen print with shades of cream and coral for this masculine and traditional bedroom. I love how the tiny pleating of the bedskirt is mimicked in the masses of fabric we used on the sunporch windows. 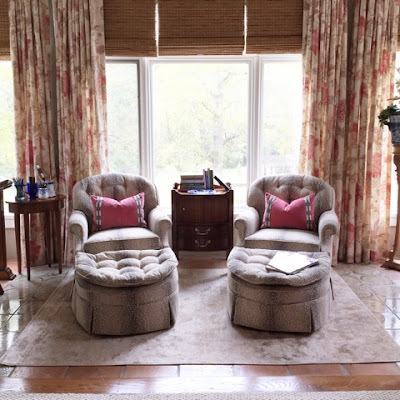 In this image, I used the ever-chic antelope fabric to recover two tufted chairs and ottomans to play off of the floral fabric of the drapes. 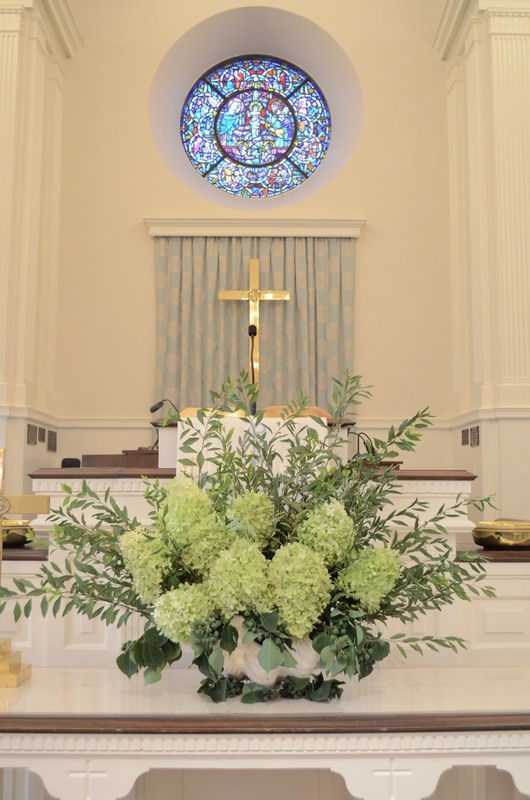 In the library of my hometown church, I used the always-right chocolate and cream buffalo check for the drapes to pull a more masculine tone paired with the raspberry rug. For this master bedroom, I went with cool shades of cream and blue, using this fun, fresh blue ikat with shades of green, aqua, and cream on the window treatments, the bedskirt, and the euro shams. This shade of blue is one of my favorites! 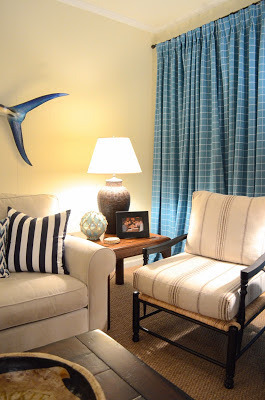 I chose the modern twist on the classic windowpane for the window treatments in a family room centered around Mr. Marlin. 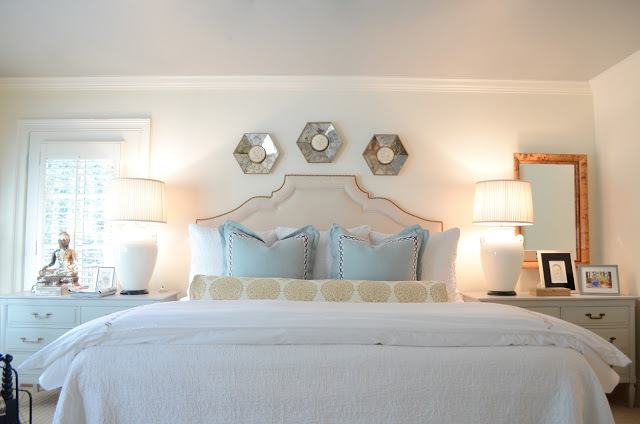 This master bedroom's cheerful bolster is a bright and happy burst against the crisp white matelasse and the soft gingham euro shams and duvet. In this clean gray and white space, I used a gray print with white banding and linen edging for blackout roman shades in the master bath. 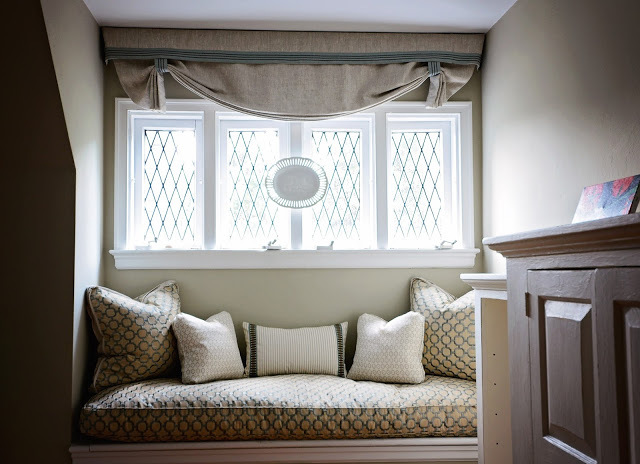 In a century-old house, where the windows are show-stoppers, I used a linen with wide tape to create the shade, careful not to mask the window. For the fluffy window seat cushion, an embroidered geometric fabric lends a graphic twist. I do love a reading nook! 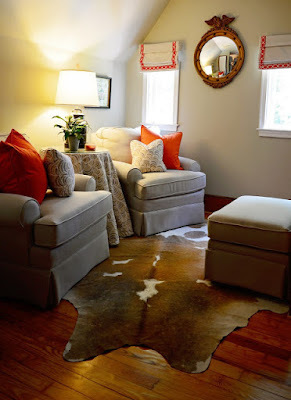 The neutral cow hide, wall color and chairs, pop with the colorful roman shade trim and with the table skirt fabric. 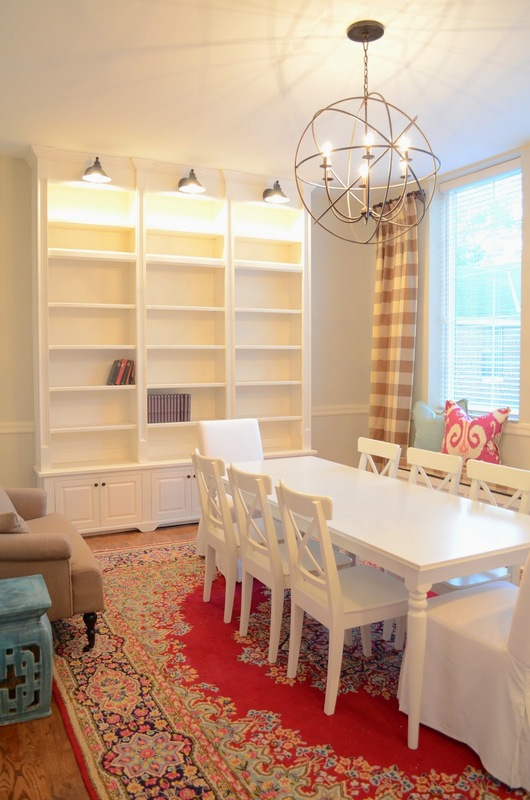 Here, in my dining room, I used my favorite L and S trim with cream linen to subtly edge the toile fabric. 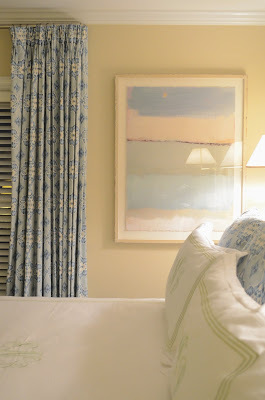 In my master, full of linen, cream, and blue, I used a fun medallion print linen for the long bolster, and a wide tape with a blue solid linen on the euro shams. 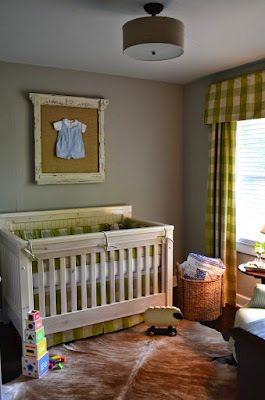 For my den, I went cray over that roman shade fabric! The large orange blossom is echoed in the pillows. The chairs are recovered in an embroidered linen with a gray geometric on the pillows - ALL from L and S! 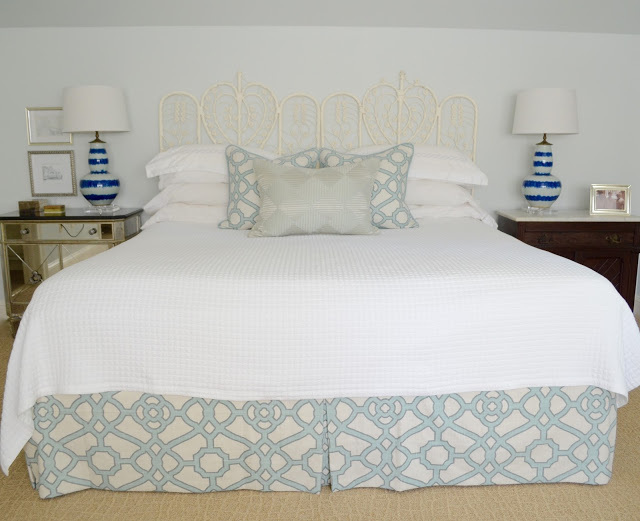 For my guest room, I combined the pretty blue and white lattice on the windows and bedding with a cappucino ikat as an accent. 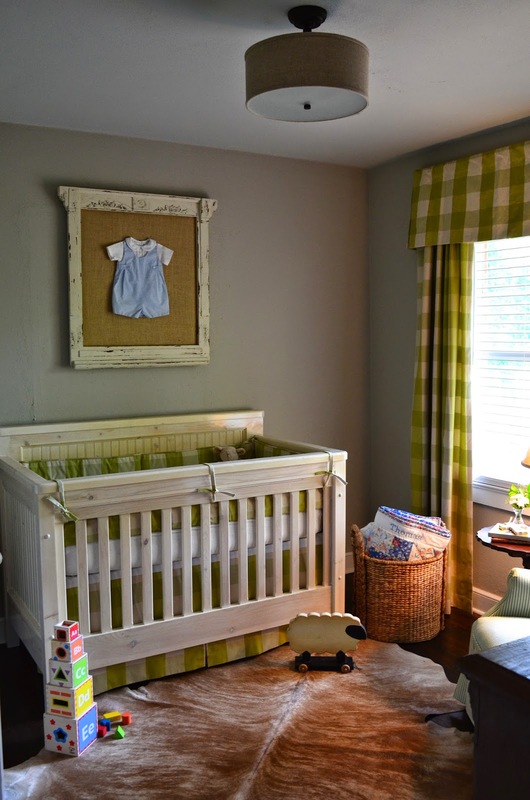 Nothing is sweeter than an apple green buffalo check for a precious baby boy's nursery! 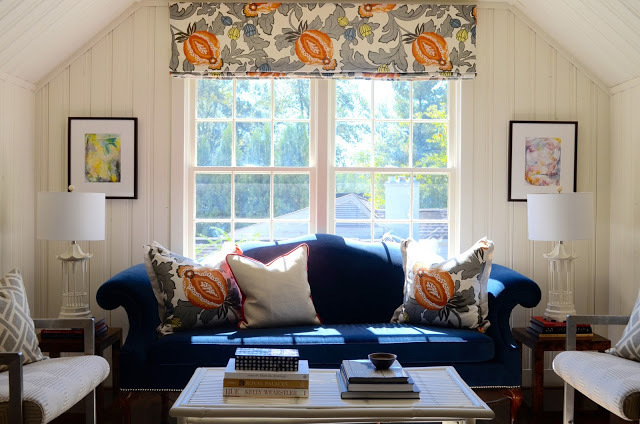 At my mom's house, we chose a bright chartruse woven for the windows treatments as a bright pop against the greige walls. 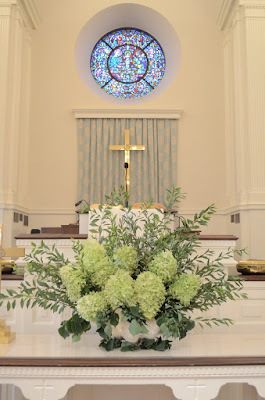 And lastly, I used a beautiful blue embroidered fabric for the alter curtain in my hometown church's sanctuary. I sure hope you guys will hop over to Lewis and Sheron's site to peruse their lovely fabrics, furniture, trims, and artwork. and Like their Facebook page too!